Yeah! I'm showing off another card that I made for Die-Versions using again the XOXO Express Edges that I received for being a guest designer (Dynamo) for the month of May. I started off using black metallic paper for my base which is a 5"x 7" finished card size. I used Bo Bunny's collection called 'Serenade' for the rest. I stamped the seed package from the set called 'Seed of Summer' by JustRite using black crafter's ink onto shimmery white paper and emboss using clear embossing powder. I also stamped the 'Top Quality' from the same stamp set on the seed package using black crafters ink and emboss using Pines Green embossing powder. I stamped 'Plants & Seeds using black crafter's ink and applied clear embossing powder, which lies underneath Top Quality sentiment. 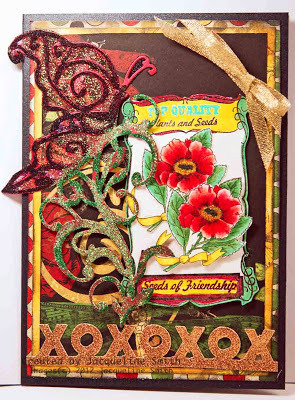 Again I stamped 'Seeds of Friendship' using black crafter's ink and emboss using burgundy embossing powder which is on the bottom of the seed package. I then took out my Lindy's Stamp Gang Magicals using the following colors; Yellow Rose of Texas, Peony Scarlet Red and Lucky Shamrock Green to add some colours to the seed package. I then took the Poppies from a different stamp set called 'Botanical Medallions & Banners by JustRite to coincide with the Poppy paper that I used from Bo Bunny. Again stamped this using black crafter's ink onto shimmery white paper and colored them using Prismacolor pencils. I then added another Die-Versions die called Whispers- Big Butterfly to the left of the seed package cutting out using red metallic paper. I then added some double sided adhesive sheet to the butterfly so I could added some glitter to the butterfly wings using some transparent Ultra Fine glitter called 'Salmon'. I wasn't really happy with the red butterfly so I decide to add some black glitter to the body of the butterfly so it would show up more, which then lead to adding light green and dark green glitter to the leaves of the plant which the butterfly sits. I then added a bow using some gold metallic ribbon and then cut out the new May release 'XOXO' using gold glitter paper. This looks fabulous! Love the sparkly butterfly and the seed packet. Gorgeous, love the beautiful colours and the poppies are stunning. A burst of summer! This is so pretty Jacqueline!